It does take a special person to fulfil a challenge that might well lead to loss of life. Commander Dilip Donde, who resides in Goa, is one such individual who stands apart as the first Indian to circumnavigate the world on his own. 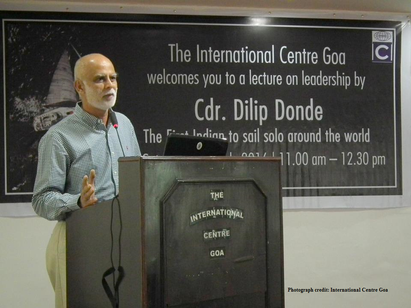 In a continuation of the Leadership lectures at International Centre Goa, Cdr Dilip Donde spoke of his adventures on board his sailing boat, the Goan built Mhadei, regaling everyone with his humour infused anecdotes and honesty. The story begins when the Indian Navy approached Cdr Donde in 2006 to volunteer in its solo expedition project Sagar Parikrama-1 in circumnavigating the world. There were 170 solo circumnavigators and not one of them was an Indian. Cdr Donde jumped at the opportunity that his colleagues had declined. He was called a fool to venture into uncharted territory where his fate would be decided solely by the whims of the sea, but that did not deter his resolve. He recalls his mother’s reaction to his decision was one of support, with advice not to go back on his decision and to see it through to its culmination. Cdr Donde was posted in the Andaman Islands at the time and was involved in diving activities there. However, he had the urge to take the road less travelled and it came in the form of this invitation from the Indian Navy. To prepare for the journey, Cdr Donde made an internet search and found rules that pertained to circumnavigating. He had to start and finish at the same port; could not pass any canals and straits; had to cross all meridians at least once; had to cross the equator at least twice; had to travel more than 21,600 nautical miles (NM); and had to go around the three great capes (Cape Leeuwin, Cape Horn, and Cape of Good Hope). The trip had to be planned in a way to allow Cdr Donde to avoid the extreme cold of the winters of the various waters he would journey through. So he decided to travel west to east, south of all the continents. A Dutch design was bought for the sailing boat to be used and it was made in Goa by Ratnakar Dandekar of Aquarius Fibre-Glas Pvt Ltd. The INSV Mhadei, however, flagged off on the 19th August, travelling from Mumbai to Freemantle. The days were long and it was a matter of good versus bad days. He had an albatross as a visitor that finally had to be shooed off. He introspects that he was a more careful sailor when the albatross was on board, which indicates the human inclination to do more when shouldering the responsibility of another being. He encountered a family of whales on this leg of his journey. From Freemantle Cdr Donde moved towards Lyttelton Port of Christchurch (New Zealand). En route he met the Roaring Forties (westerly winds of immense power found in the Southern Hemisphere). The tremendous waves created by the winds shredded one of the sails. Amidst the rolling seas, Cdr Donde managed to replace the sail. Part of the boat was wrecked as well. As if this were not enough, he came to the realisation that he had miscalculated how cold it would be. He says, ‘When it’s that cold it really freezes your brain. Basic thinking becomes difficult. I had to make an effort even with the mundane chores.’ The only diversion from this sorry state of affairs was a seal that began following the boat. ‘It was one of those things that makes you want to go back to sea. They have very expressive eyes. It would come very close to the boat and make eye contact. It was like a little pup following you,’ says Cdr Donde. At Christchurch Cdr Donde was greeted with a traditional Maori dance and had Ratnakar Dandekar and Cdr Tomy to help him with the next part of his journey. The next leg was Lyttelon to Port Stanley (Falkland Islands) and sailing in the vast ocean brought an awareness as Cdr Donde says, ‘You realise how big the Pacific is when you try to sail it in a sailboat.’ The middle of this leg saw both autopilots fail with 30 minutes of each other which posed a serious problem since autopilots were needed to steer the boat while other chores were carried out. He managed to keep the boat at an angle to the wind with the technically challenging windvane self-steering equipment. During this time there was some communication between Cdr Donde and Australian Jessica Watson who was attempting solo non-stop circumnavigation round the world. They had been advised by New Zealand rescue services to stay in touch because they were the only help available to each other. The last two legs were from Port Stanley to Cape Town and Cape Town to Mumbai. Towards the end the cooking gas ran out and food had to be rationed. Eventually Cdr Donde had to rely on chocolates and cereal bars. He entered Mumbai on 19th May 2010 and was hosted by the Navy for a few days. On hoisting the flag on 22nd May, he was received by the Vice President of India. He comments on the fickleness of sea waters saying though the official date to reach Mumbai was 22nd May, the sea decided it should be the 19th. 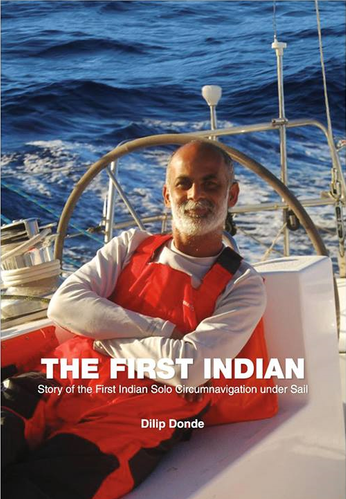 *Cdr Dilip Donde has written a book about his sea journey called The First Indian: Story of the First Indian Solo Circumnavigation under Sail.